A study in Crypto-Archaeology by Tim McGuinnes, Ph.D. The amount of speculation about these unusual artifacts is at an all time fever pitch. Especially with the new Indiana Jones Crystal Skull movie coming. People all around the globe fantasize about these crystal objects carved to resemble human skulls, or in some cases human-like skulls. Many claim to own authentic original crystal skulls, with fantastic pseudo-science research to back up their reported origins and age. Some claim they are artifacts from extraterrestrial civilizations. Scholars from many countries have examined them (myself included), and arrived at a wildly mixed set of theories and dating results. Some have claimed they are all hoaxes, some are hoaxes, that they are thousands of years old, or are contemporary. Yet the undeniable fact remains that they exist. That at least two have significantly important origins. And that there is no consensus on their age. I myself was fortunate to be able to examine both major skulls some years ago, and arrived at conclusions that fit the available facts. Unfortunately, spectrographic and chemical analysis is lacking on them both. Yet, in fact, they both raise more questions than are answered. 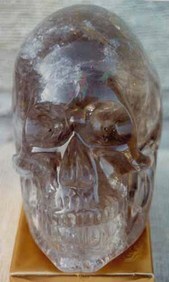 There have been many human skulls that have been carved and polished out of a of crystal of quartz rock. The two skulls in question on this page have been carved from a unique type of quartz and are of life-size (approximately the size of an average adult human skull). Skulls are an immediately recognizable symbol of death, both in modern times, and in the pre-columbian eras as well. To believe the stories online, supposedly thirteen crystal skulls of apparently ancient origin have been found in parts of Mexico, Central America and South America. However, absolutely NONE have any proof of context, and in my opinion all but two have clear modern tool marks. Thus, all but two have to be treated as fakes. This page is devoted to the main two Crystal Skulls. These are the "Mitchell-Hedges" skull and a skull owned by the British Museum in London. The two Skulls are not identical, though they show dramatic similarities in craft and design. While there is much debate on this issue, there appears to be evidence that both skulls originated from the same artisan or clan of artisans, while other skulls originated with a French craftsman. The British Museum's skull was part of the exhibit at the The Museum of Mankind in London for many years, which is where I was able to examine it. The BM skull appears incorrectly labeled as of Aztec origin. While the Nahuatl speaking peoples of Mexico's Tenochtitlan were keen devotees of skulls in any form. This was, after all, just guesswork on the part of the museum staff in setting up the display. According to available sources, The British Museum obtained the skull from the New York jeweler Tiffany's i the early 1930's. There is a tale that Tiffany's obtained it from a sailor of fortune's wife in 1929, who's husband brought it back from Cocos Island, an island belonging to Costa Rica, many years earlier. There is an obscure reference to this sailor's visit to the island in his writings, and a reference to more of the same - though clearly this is not the original home of the skull, but if this story is true, it would have been deposited on the island by local pirates (most likely Morgan - for which there is ample proof - you though Johnny Depp's pirates having pre-columbian artifacts is just a Disney story?). Though there is another story that it was brought out of Mexico in the 1890's. There are other rumors that it was part of a collection amassed by a mysterious soldier of fortune in Mexico, however, I believe this to be confusion, since there is evidence of a crystal skull being "pawned" to the jeweler in question. More recent claim, is that examinations of the BM skull seem to indicate that the tools used to make it are most likely more modern than originally thought, placing the age of the skull at a century and a half at the most. However, having been able to view the BM skull myself, I can not dispute such claims. But now we know for a fact that the skulls are of modern origin. And yes, these skulls were made by humans - no need for extraterrestrial origins. However, the skull is so strangely hypnotic that there is a story that the cleaning staff at the museum at least one time insisted that the object be covered with a black cloth before they worked around it at night. The Mitchell-Hedges skull (top photo) has an even more confused history than the British Museum Skull. F.A. 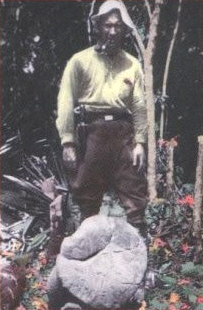 Mitchell-Hedges was a self-proclaimed British adventurer during the early twentieth century. He told stories about how he gambled with J.P. Morgan, roomed with Leon Trotsky and fought with Pancho Villa. Some or all of these appear to be tall tales. However, tall tales have there basis in reality, as this author can attest. How the skull came into Mitchell-Hedges possession is a question of debate. We know that Mitchell-Hedges was in possession of it by 1944. That year a member of the staff of the British Museum had bid on the skull at an auction and made this note: "Bid at Sotheby's sale, lot 54, 15 x 43 up to 340 pounds (Fairfax). Brought in by Burney. Sold subsequently by Mr. Burney at auction at Sotheby's in London, in 1943 to Mr. Mitchell-Hedges for 400 pounds". This was a fortune in the day. It is said, that Mr. Mitchell-Hedges had always indicated that he had found the skull in an Mayan temple in British Honduras (now Belize), though he seemed never to reveal the details, writing: "How it came into my possession I have reason for not revealing." Would it surprise you to know that Tiffany's may have acquired both skulls? And later sold one to Mitchell-Hedges? Some researchers believe the story about finding the skull in British Honduras was just another tall tale and Mitchell-Hedges obtained it through an art dealer. However, the same sailor of fortune, may be the source for both skulls. Mitchell-Hedges' adopted daughter, Anna Mitchell-Hedges, who inherited the skull when he died, supported her father's story. She explained her father "placed the skull with Burney, the art dealer, as collateral for a loan. When he realized Burney was trying to sell the skull, he bought it back". Anna Mitchell-Hedges also claimed that it was she who discovered the skull on her 17th birthday while with her father in British Honduras. She claims she found the skull, missing the jaw, under an alter. Three months later she found the jaw in the same room. Very improbable. However, there were never any other similar crystal artifacts found at that site, or in other sites in the immediate region. Thus to have found the singular BH Skull there would have almost been the equivalent of finding a Volkswagen under the alter! The BM Skull, clearly an unusual stone, is reported weigh 11 lb, 7 oz (5.19kg) and is carved from a single quartz rock crystal (as is the BM Skull). While crystals of this size and clarity are not very common, they have been found weighing tons. Mr. Mitchell-Hedges often referred to it as the "Skull of Doom." (a useful marketing ploy.) The separate jaw most likely would have been affixed by either gold wire or woven twine, possibly allowing movement. There has been fanciful speculation that the skull was used as an oracle, the jaw operating by remote control as a voice came from a hidden speaker tube, but there is absolutely no evidence to support this. A Dr. Morant was able to examine both skulls: the Mitchell-Hedges skull and the skull at the Museum of Mankind together in 1936. He noted the skulls were very similar in many anatomical details and suggested that the one in the museum might be a slightly rougher copy of the Mitchell-Hedges skull. This is confirmed by my own findings decades ago. The skull remains in the possession of the octogenarian Anna Mitchell-Hedges. She resides in Canada and displays the skull on frequent tours. Anna has maintained for all these years that she discovered the skull, even though there is reason to doubt that she was present at the Lubaantun expedition at all. 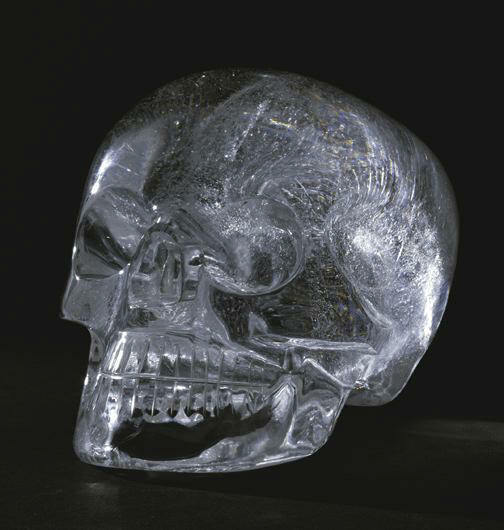 The Mitchell-Hedges skull is made of clear quartz crystal, and both cranium and mandible are believed to have come from the same solid block. It weighs 11.7 pounds and is about five inches high, five inches wide, and seven inches long. Except for slight anomalies in the temples and cheekbones, it is a virtually anatomically correct replica of a human skull. Because of its small size and other characteristics, it is thought more closely to resemble a female skull -- and this has led some to refer to the Mitchell-Hedges skull as a "she." The Mitchell-Hedges family loaned the skull to Hewlett-Packard Laboratories for extensive study in 1970. Art restorer Frank Dorland oversaw the testing at the Santa Clara, California, computer equipment manufacturer, a leading facility for crystal research. The HP examinations yielded some startling results. Researchers found that the skull had been carved against the natural axis of the crystal. Modern crystal sculptors always take into account the axis, or orientation of the crystal's molecular symmetry, because if they carve "against the grain," the piece is bound to shatter -- even with the use of lasers and other high-tech cutting methods. To compound the strangeness, HP could find no microscopic scratches on the crystal which would indicate it had been carved with metal instruments (in stark contrast to a recent report by the British Museum). Dorland's best hypothesis for the skull's construction is that it was roughly hewn out with diamonds, and then the detail work was meticulously done with a gentle solution of silicon sand and water. The exhausting job -- assuming it could possibly be done in this way -- would have required man-hours adding up to 300 years to complete (obviously a biased observation). In 1970, art conservator and restorer Frank Dorland was given permission by the Mitchell-Hedges estate to submit the quartz skull to tests conducted at the Hewlett-Packard Laboratories at Santa Clara, California. From these tests, and from careful studies done by Dorland himself, the skull revealed a whole array of anomalies. When submersed in a benzyl alcohol bath, with a beam of light passing through, it was noted that both the skull and jaw piece had come from the same quartz block. What was astounding to the testers, however, is they found that the skull and jaw had been carved with total disregard to the natural crystal axis in the quartz. In modern crystallography, the first procedure is always to determine the axis, to prevent fracturing and breakage during the subsequent shaping process. Yet, the skull's maker appears to have employed methods by which such concerns were not necessary. The unknown artist also used no metal tools. Dorland was unable to find signs of any tell-tale scratch marks on the crystal, under high-powered microscopic analysis. Indeed, most metals would have been ineffectual, for the crystal has a specific gravity of 2.65, and a Mohs hardness factor of 7. In other words, even a modern penknife cannot make a mark on it. From tiny patterns in the quartz near the carved surfaces, Dorland determined the skull was first meticulously chiseled into a rough form, probably using diamonds. The finer shaping, grinding and polishing, Dorland believes, was done by applying innumerable applications of solutions of water and silicon-crystal sand. The big problem is, if these were the processes used, then, as Dorland calculated, it would mean that a total of 300 man-years of continuous labor was spent in making the skull. We must accept this almost unimaginable feat, or admit to the use of some form of lost technology in the skull's creation the likes of which we have no equivalent today. The enigma of the skull, however, does not end with just its making. The zygomatic arches (the bone arch extending along the sides and front of the cranium) are accurately separated from the skull piece, and act as light pipes, using principles similar to modern optics, to channel light from the base of the skull to the eye sockets. The eye sockets in turn are miniature concave lenses that also transfer light from a source below, into the upper cranium. Finally, in the interior of the skull is a ribbon prism and tiny light tunnels, by which objects held beneath the skull are magnified and brightened. Still another finding about the crystal skull reveals knowledge of weights and fulcrum points. The jaw piece fits precisely onto the skull by two polished sockets, which allow the jaw to move up and down. The skull itself can be balanced exactly where two tiny holes are drilled on each side of its base, which probably once held suspending supports. So perfect is the balance at these points that the slightest breeze causes the skull to nod back and forth, the jaw opening and closing as counter-weight. The visual effect is that of a living skull, talking and articulating. The question, of course, is what purpose did this serve? Was the skull only designed by its artist as a clever toy or conversation piece, or, as Dorland believes, was the talking skull meant to be used as an oracular device, through strange phenomena associated with the crystal skull, that defy logical explanation. Observers have reported that, for unknown reasons, the skull will change color. Sometimes the frontal cranium clouds up, looking like white cotton, while at other times it turns perfectly clear, as if the space within disappears into an empty void. Over a period from 5 to 6 minutes, a dark spot often begins forming on the right side and slowly blackens the entire skull, then recedes and disappears as mysteriously as it came. 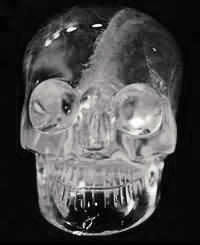 Other observers have seen strange scenes reflected in the eye sockets, scenes of buildings and other objects, even though the skull is resting against a black background. Still others have heard ringing noises emanating from within, and at least on one occasion, a distinct glow from no known light source surrounded the skull like an aura for up to six minutes. The sum total of the skull appears to take in all five physical senses of the brain. It changes color and light, it emits odors, it creates sound, it gives off sensations of heat and cold to those who touch it, even though the crystal has always remained at a physical temperature of 70 degrees F under all conditions, and has even produced sensations of thirst and sometimes of taste in a few cases. Dorland is of the opinion that what is happening in all this phenomena is that the 'crystal stimulates an unknown part of the brain, opening a psychic door to the absolute.' He observes - crystals continuously put out electric-like radio waves. Since the brain does the same thing, they naturally interact. He has found, too, that periodic happenings in the crystal skull are due to the positions of the sun, moon and planets in the sky. Researcher Marianne Zezelic agrees that the skull was primarily used to stimulate and amplify the psychic abilities in its handlers. She wrote, Crystal serves as an accumulator of terrestrial magnetism. By gazing at the crystal, the eyes set up a harmonic relation stimulating the magnetism collected in that portion of the brain known as the cerebellum. The cerebellum therefore becomes a reservoir of magnetism which influences the quality of the magnetic outflow through the eyes, thus setting up a continuous flow of magnetism between gazer and crystal. The amount of energy entering the brain eventually increases to such a proportion as to affect the poles of the brain, a region extending just above the eyes, contributing to psychic phenomena. 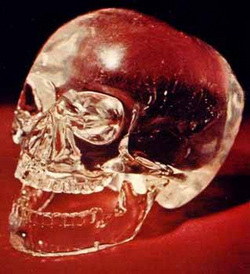 Going a step further, Tom Bearden, an expert in the field of psychotronic studies, believes that, in the hands of a skilled mediator and mental focalize, the crystal skull also served not only as a vehicle to transform life field energy into electromagnetic energy and other physical effects, but also aided in healing, by the altering of its crystalline resonance to match that of a patient's mind and body frequencies, and affecting curing energies on the skull that would manifest in the patient's auric field. 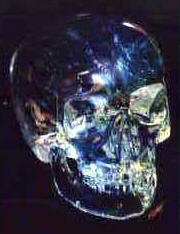 The skull should thus be used as an amplifier and a transmitter of psychic and earth energy forces. When looking at the sum total of skill and knowledge incorporated in the Mitchell-Hedges skull, modern science is stumped as to how to explain it. Author Garvin summarized the findings in these words, "It is virtually impossible today, in the time when men have climbed mountains on the moon, to duplicate this achievement." The lenses, light pipes, and prisms alone display a technical competence that the human race only achieved recently. In fact, there is no one today who could attempt to duplicate the carving.